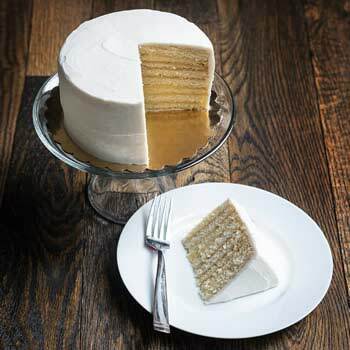 Originally developed exclusively for Nordstrom Cafe, this cake features moist, made from scratch lemon cake, a wonderful housemade lemon curd between every layer, and lemon buttercream frosting. The cake is approx. 6" in diameter, 3.5" tall, and yields 7-9 slices. Like all SIBC products, it is shipped frozen with dry ice in a gorgeous, recyclable box.